Located conveniently in North Jakarta, Ravarine Suite Apartment is a 2-minute walk to Mall of Indonesia. Guests can have free access to the fitness centre and swimming pool provided in the apartments. The suite is simply furnished with modern furniture and fits a flat-screen cable TV with DVD player, desk and sofa. It is completed with a well-equipped kitchen and en suite bathroom with shower and free amenities. 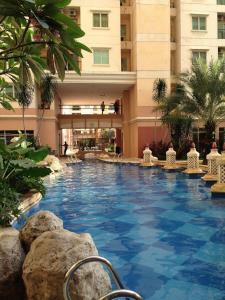 It is a 10-minute drive to Mall Kelapa Gading and is a 45-minute drive to Soekarno-Hatta International Airport. Ravarine Suite Apartments has a garden, children’s playground as well as a tennis court for guests’ conveniences. Free Wi-Fi is provided in the suite. A variety of dining options can be found within a 2-minute walk from the apartment.